This post is by Dayna Cunningham, Executive Director of CoLab. During the Emerald Cities Community Engagement Summit we visited the Evergreen Coop’s worker-owned laundry and solar installation companies. These are two for-profit community owned businesses that are seeking to leverage the emerging green economy locally by speaking to the procurement needs of large institutions that are anchored physically to, and cannot leave, the city. It’s a wealth-creation strategy for low-income and marginalized communities that surround the tiny urban core. That core of anchored institutions generates a huge share of the city’s wealth, but, until now, there haven’t been mechanisms for the communities around the core to harness that wealth creation and use it to improve their lives and livelihoods. The Evergreen folks estimate that the worker owners’ stake in the laundry coop will be worth $65,000 in five years. For at least some of the worker-owners, that will mean going from unemployment to a pretty nice nest egg in that time. 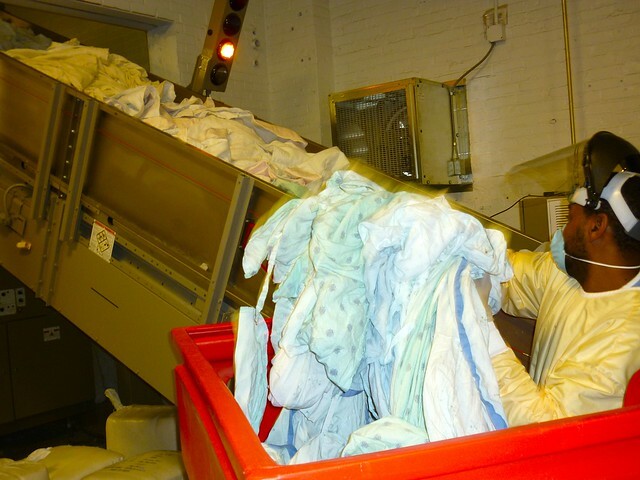 A worker at the Evergreen Cooperative Laundry loads laundry. Photo by Rob Crauderueff. When we met with the Evergreen worker-owners, some of our labor brothers raised concerns about workers’ rights: What is the grievance procedure? What happens if you are wronged, who will take up you? In essence, who is the boss and how do you fight the boss? The Evergreen worker-owners seemed a bit surprised. Their response: We, collectively, are the boss. We have committees and the whole coop votes on important matters. If all of the workers have spoken, and vote you out, you’re out. I did not think about this until I got to Cleveland. I have not studied this in depth. But Evergreen makes clear to me the potential for coops to be another form of democratic worker organization. They are not unions, but share the core labor principles of worker voice, power and livelihood security. They help workers secure fair treatment in the market by creating a different mechanism for collective deliberation, negotiation and action on their interests. It also enables them collectively to create value in the marketplace that builds their wealth. Undoubtedly, in practice not all coops are democratic organizations controlled by workers. In many, it is likely that ownership is highly diluted, and professional management acts on behalf of the very large class of owners. However, by virtue of the corporate structure that provides for collective ownership with voting rights, all coops have the potential to be better instruments for worker power. What if the labor movement examined the potential for coops to work in this way and began developing and supporting their own worker-owned coops, not instead of, but in addition to the current forms now used by unions to address workers’ needs? I continue to be struck by a dynamic that Emerald Cities is struggling with. We know that community/labor partnerships are the only way to make Emerald Cities strong. Many of us also believe that deep community/labor partnerships represent the best possible pathway for strengthening communities and ensuring the power of the labor movement. 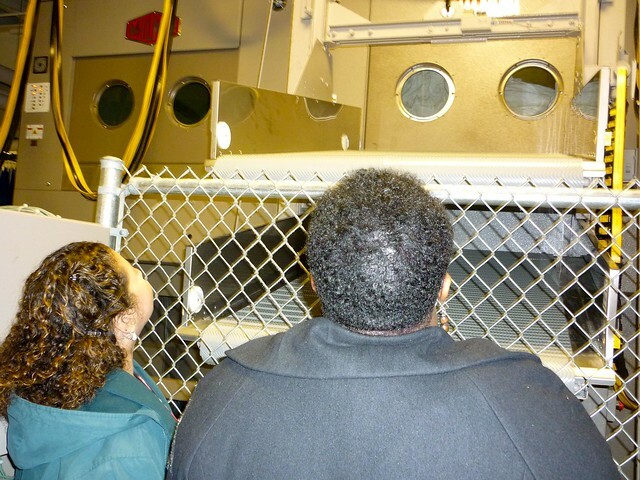 Members of the Emerald Cities Collaborative Community Engagement Summit look in awe at the giant green laundry facilities at the Evergreen Cooperative Laundry. Photo by Rob Crauderueff. At the Summit, it seemed to me that the community organizations and labor came prepared to build relationships and explore collaboration. I felt a lot of mutual respect in the room. Deborah Scott’s (of Georgia STAND UP) conducted a quiz for the group of cities present that reminded us that labor is a part of community. Yet community groups tend to be small and under-resourced and in any given city, there are thousands of community organizations, many of them focused on single issues. There are few if any forums for discourse and deliberation across issue silos, and, most importantly, no mechanisms to pool resources and to decide on, and develop plans for, unified and collective action. In this sense, labor’s strength and influence will vastly outweigh the power of community organizations for a long time to come. What can Emerald Cities do about that, particularly if we understand that the best way to strengthen both communities and the labor movement is through deep collaboration and partnership? I am not sure. But I do know that in many cities, ECC is the broadest table in town where labor, community organizations, community development, workforce development and others are sitting to figure out their shared interests and shared future. I think this is a great place to start exploring this very difficult question, not occasionally or reactively after a crisis, but in an ongoing way as a central part of the business at hand. I am hoping that the Summit has helped to make this question more visible so we can begin to deal with it.